Our hotel rooms in Detroit, Michigan provide all the comfort and convenience you need for short and long stays near the airport. 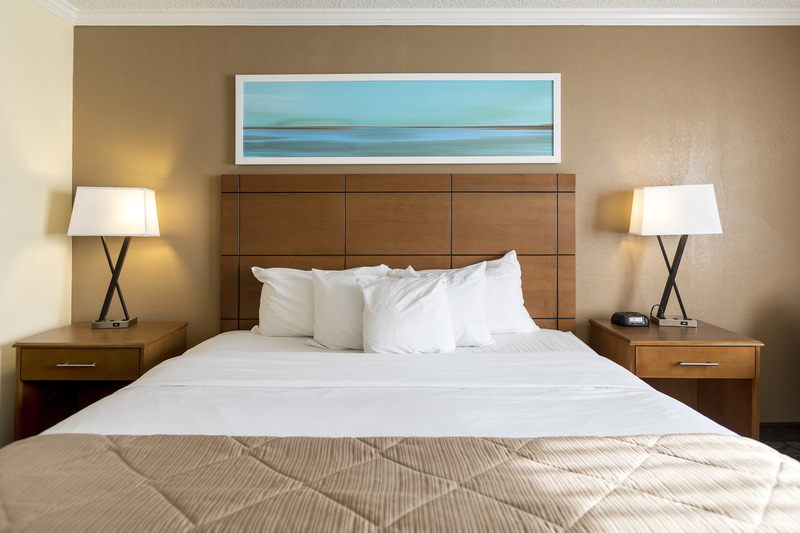 Settle into plush beds with modern amenities at your fingertips. Outside your room, our eye for detail continues with features that make traveling easy. Lightning fast Wi-Fi follows you through the hotel, from your room to the common area, where we provide free breakfast and a full-service restaurant and lounge. Enjoy the sunshine at our outdoor pool, overlooking the green lawn behind the hotel. 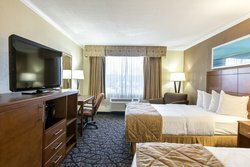 Book a comfortable and convenient hotel room in Detroit by the airport today! Stretch out in a wide king bed with all the amenities you need for a convenient trip at your fingertips. 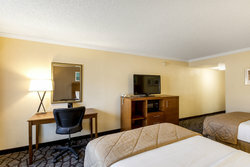 Each king room has a mini-fridge, microwave, a flat-screen HDTV, and all the space you need for a wonderful trip to Detroit. Enjoy a little bit of extra space in our king hotel rooms near Detroit Airport with a two-person hot tub. Bubble away your troubles in an in-room Jacuzzi with relaxing water jets. This spacious room includes a comfortable king bed, flatscreen TV, and space to work. 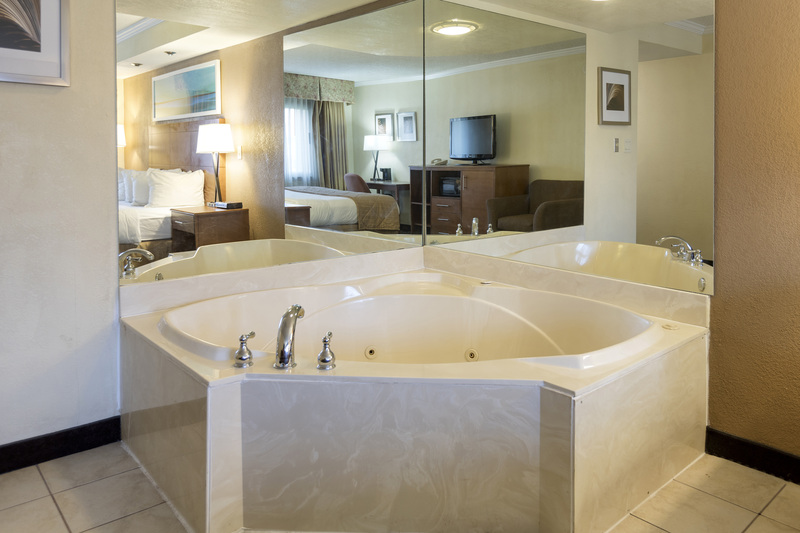 Enjoy a little bit of extra space in our king rooms with a two-person hot tub. Bubble away your troubles in an in-room Jacuzzi with relaxing water jets. 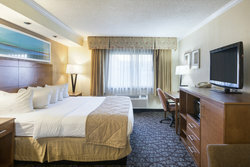 This spacious room includes a comfortable king bed, flatscreen TV, and space to work. Upgrade your stay to enjoy the supreme pleasure of a jacuzzi in your room. Find time to pamper yourself with ease! Travel with a group while still enjoying an affordable trip! 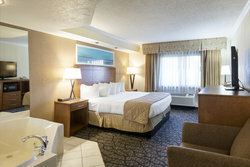 Our double hotel rooms make trips to Detroit a breeze. Before tucking in for a peaceful night’s sleep close to the airport, watch TV on the large TV provided in your room, and get ready in a pristine new bathroom. 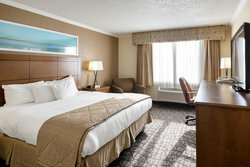 Our straightforward One Queen room has all the comforts of home in a hotel room near Detroit Airport. Store a snack in your room’s mini-fridge, get ready in the pristine bathroom, and then sleep with ease in the queen bed with modern wooden headboard. Wake up well-rested and rejuvenated in our plush beds with fluffed pillows and soft duvets. Stretch out in a wide king bed with all the amenities you need for a convenient trip at your fingertips. Each king room has a mini-fridge, microwave, a flat-screen HDTV, and all the space you need for a wonderful trip to Detroit. 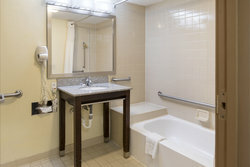 The bathroom in our accessible rooms includes a tub with a seat. Travel with a group while still enjoying an affordable trip! Our accessible double hotel rooms make trips to Detroit a breeze. Before tucking in for a peaceful night’s sleep close to the airport, watch TV on the large TV provided in your room, and get ready in a pristine new bathroom. The bathroom in our accessible rooms includes a tub with a seat.